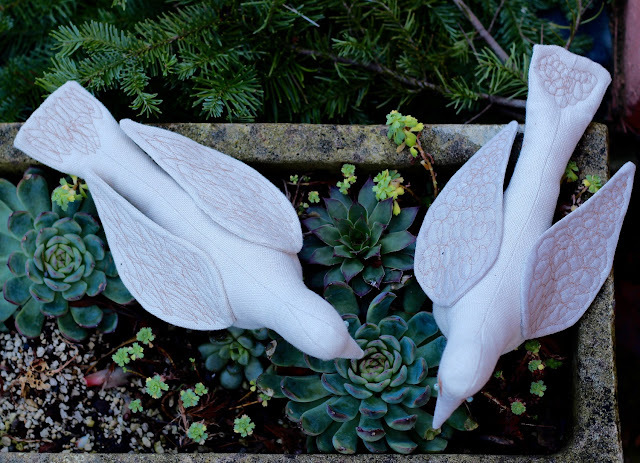 We often feature themes of Peace for the New Year, and we thought you might enjoy this lovely Peace Dove project by Portland, Oregon's Thread and Whisk. This year, we wish you inner peace - the peace that comes from an abiding sense of gratitude. P.S.- Check out our many NEW listings at QuiltInspire on eBay ! And for continuous free quilt patterns, please follow us on Twitter! Thread and Whisk first posted this free project in December 2015. 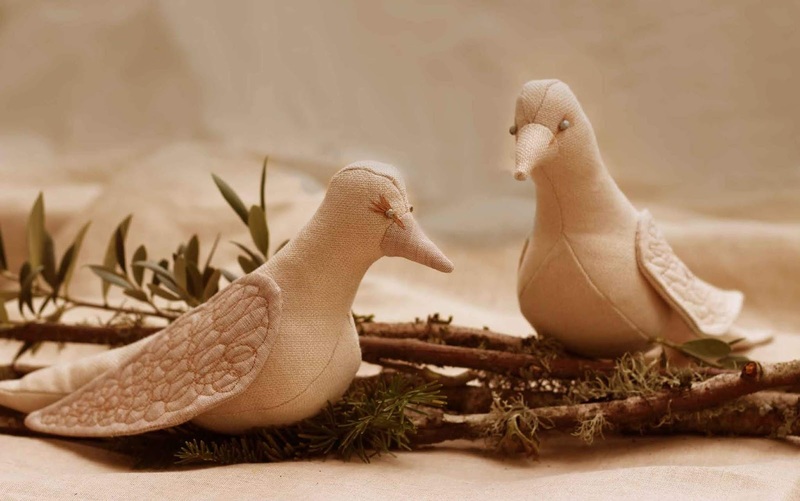 They note, "The release of a flock at a wedding or a single dove carrying an olive branch to symbolize accord are signs of optimism and hope for the days ahead." The dove's wings and tail are enhanced with free motion sewing machine stitching, and the eyes are created with embroidery thread and beads. At the Thread and Whisk website you will find some really creative and thoughtful projects - like their Hand and Heart Warming Pillow - and inspiring recipes like Salmon Tartines, which makes 12 delicious canapés for the New Year. Everything is beautifully photographed. We confess that we are in love with their stylish Grace Aprons, made of 100% linen. They make wonderful gifts, and will help you love your time in the kitchen ! Image credits: Photos are copyrighted by Thread and Whisk and are used here with permission. Welcome to Twelve Days of Christmas: Day 12 ! It's Christmas Eve, and the conclusion of Twelve Days of Christmas Quilts. We wish you a very happy, healthy and creative holiday and New Year ! Here's a lovely quilt by Cindy Greco that reflects the light and hope of the Christmas season, with the Star of Bethlehem shining brightly overhead, and the angels and animals present at the simple manger where Jesus was born. Cindy found this pattern, the Silent Night Nativity Art Quilt, at Nancy's Notions. At the time, it was apparently sold as a kit, with the fabric provided. Cindy explains, "The instructions stated that each of the 7 patterns should be its own quilt, but I reconfigured them as one quilt. I used Wonder Under for fusing the pieces to the background and stitched each piece onto the backing with invisible thread. I also used metallic thread for the Star of Bethlehem rays." Cindy adds, ...."The different fabrics were not labeled with their names, and many pieces were very similar in color, so it took a long time to figure out the proper colors for the pattern. There was a color code in the instruction booklet, but the colors listed did not necessarily match any of the fabric provided. It was a challenge." As quilters who have worked with kits containing incomplete directions, we can certainly relate to Cindy's situation.But she has beautifully overcome the challenges, and the result is a quilt that is most radiant and joyful, with excellent workmanship. "She gave birth to her firstborn son and wrapped him in bands of cloth, and laid him in a manger." Just as this quiet manger scene reflects the peace and light that the birth of the Christ child brought to the world, we wish all of our readers a joyous season of peace, light, and renewal. Merry Christmas, everyone. Image credits: Photos were taken by Quilt Inspiration at the 2018 quilt show of the Guild of Quilters of Contra Costa County, California. Welcome to Twelve Days of Christmas: Day 11 ! This delightful, original applique quilt won second place, and $750, in the Art - Pictorial quilt category at the 2018 Road to California show. 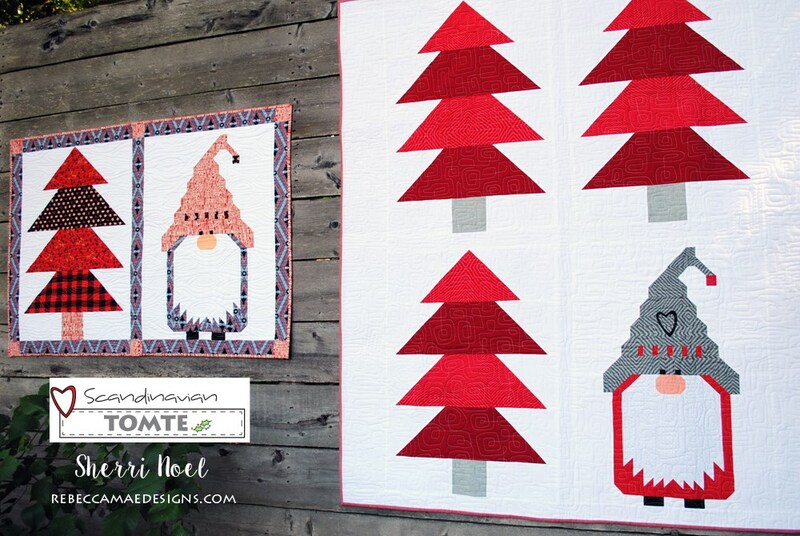 The creator and quilter, Karen Turnbull, says that her Norwegian heritage inspired her to create a Scandinavian [Christmas] scene. "I was inspired to make a fireplace scene to hang on my living room wall each Christmas, because my house doesn't have a real fireplace and mantel." The technique is fused, raw-edge applique, using Pellon Wonder-Under, and sewn on a domestic Janome machine. Karen says, "I even taught myself to make Norwegian Hardanger lace to decorate the stockings and mantel." 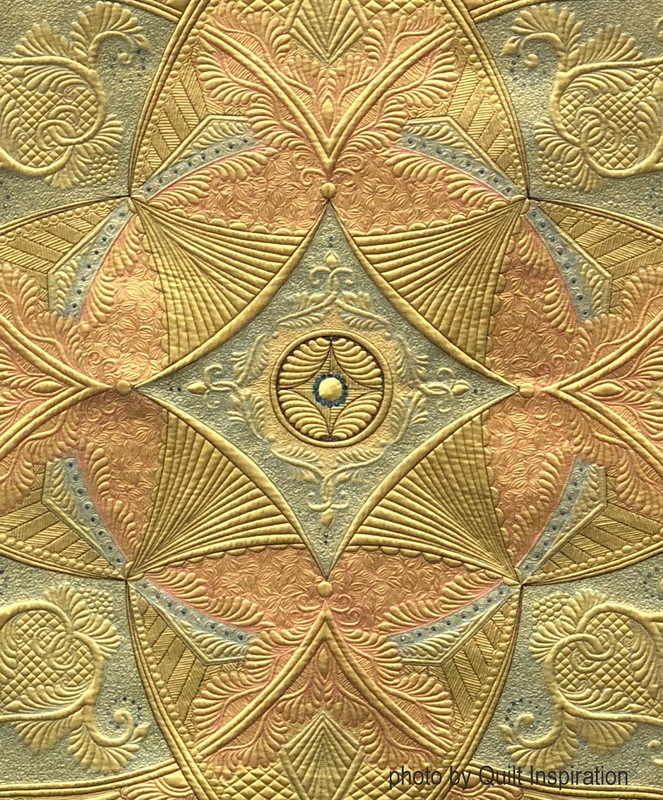 She also created the appearance of fireplace tiles, and quilted floral motifs within the "tiles", as shown below. Each part of this quilt has something fun to see, including the pretty woven and embroidered ornaments on the tree! Image credits: Photos were taken by Quilt Inspiration at the 2018 Road to California show. Welcome to Twelve Days of Christmas: Day 10 ! It's Day 10 of Twelve Days of Christmas Quilts. We wish you a very happy, healthy and creative holiday and New Year ! Quiltmaker Connie Fittro won the Honorable Mention award in the Applique Medium/Large Quilts category for her very pretty quilt, Sage County Christmas in the 2018 Quilt Arizona show. Long triangles in various red and green prints are appliqued together, which gives a sense of depth, dimensionality, and sparkling lights to this elegant pattern. By sewing your own buttons on the ends of the tree, you could even decorate the tree by hanging tiny ornaments on the buttons! Sage County Christmas is a pattern designed by Laura Estes, who lives in the semi-arid region of Eastern Washington State, where there is lots of sagebrush and deer. As of this writing, you can find this pattern for sale at Quilter's Warehouse. Another version of this quilt pattern is available for purchase on E-Bay -- the horizontal Sage Country Mantle Tree. Both patterns would be lovely additions to decorate your home for the holidays. Image credits: Photos were taken by Quilt Inspiration at the 2018 Quilt Arizona show. Welcome to Twelve Days of Christmas: Day 9 ! 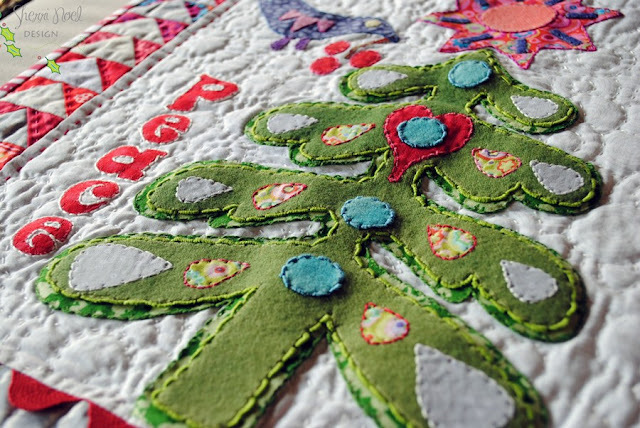 Believe it or not, it's that time of year again: time for Twelve Days of Christmas Quilts ! We are featuring an inspiring quilt each weekday, ending on Christmas Eve. We wish you a very happy, healthy and creative holiday season. This adorable mini qult really caught our eye, with its folk art tree, topped with a sunny star. This is a FREE PDF pattern that can be downloaded at Rebecca Mae Designs ! The applique pieces were cut from either quilting cotton or wool. Sherri Noel used perle cotton to do the big stitch hand quilting (see the helpful hand quilting tutorial on her website). The applique pieces are edged with bullion knots or backstitch, also done with perle cotton. If you love this applique style (as we do), check out Sherri Noel's Jul i Scandinavia (Christmas in Scandinavia) applique wall quilt pattern, done in red and white... you can read all about it here! Image credits: Images are the copyright of Sherri Noel at Rebecca Mae Designs and are used here with permission. Welcome to Twelve Days of Christmas Quilts: Day 8 ! Blue ribbon winner for Best Machine Embroidery at the 2018 Quilt Arizona show, Monikia explains, "Absolutely love doing Claudia Dinnell's embroidery designs. This is my seventh, and I really learned a lot from Claudia." Because Claudia Dinnell's machine embroidery designs involve the very popular embroidery cross stitch pattern that many of us learned as children, her lovely patterns seem especially homey and familiar during the holiday season. You can also see the outline stitch pattern, used to accentuate the holly berries and leaves, plus the base of this fun snow globe. Everything seems to hark back to the joys of Christmases long ago. Claudia Dinnell's charming redwork and lacework embroidery designs, including Tis the Season are downloadable from her website, claudiascreationsaz.com . Just scroll down to the bottom of her home page, and you'll see the download button for Tis the Season. What a fun project ! Welcome to Twelve Days of Christmas: Day 7 ! This adorable quilt is made entirely of patchwork, with the exception of the fused heart on the little guy's hat, so it goes together quickly! Image credits: Images, copyrighted by Sherri Noel, were used with permission. Welcome to Twelve Days of Christmas: Day 6 ! 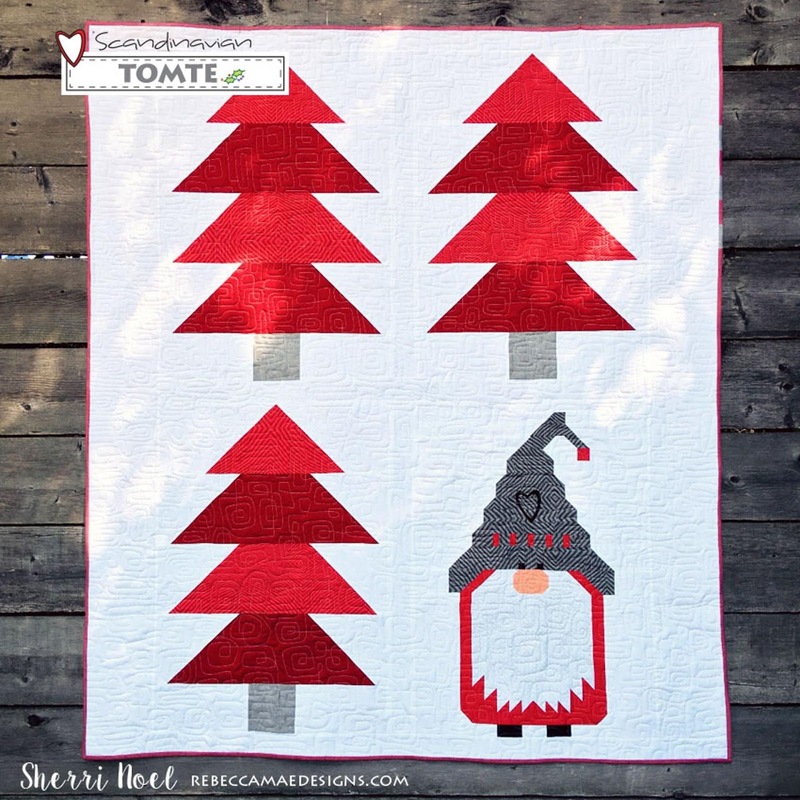 Constance Clark won a Third Place ribbon in the Applique - Small category for this quilt, titled Bring Home the Perfect Tree. About the name, she says, "My husband spent high school and college summers trimming Christmas trees. The Bringing Home the Tree pattern [from Buttermilk Basin] evokes cold memories of our searches for the perfect tree." In the photo above, the "perfect tree" is carted home in a vintage red truck, and is even accompanied by a wrapped present. The truck has a wreath on its door. The cool background color brings to mind snow, and it's not surprising to see appliqued snowflakes falling from the sky! This little snowman has his own block! He is embellished with tiny buttons and embroidery stitches. This close up photo shows Constance Clark's excellent wool applique, embroidery, blanket stitch, and quilting skills ! (She quilted this piece herself). Welcome to Twelve Days of Christmas: Day 5 ! Oh ! 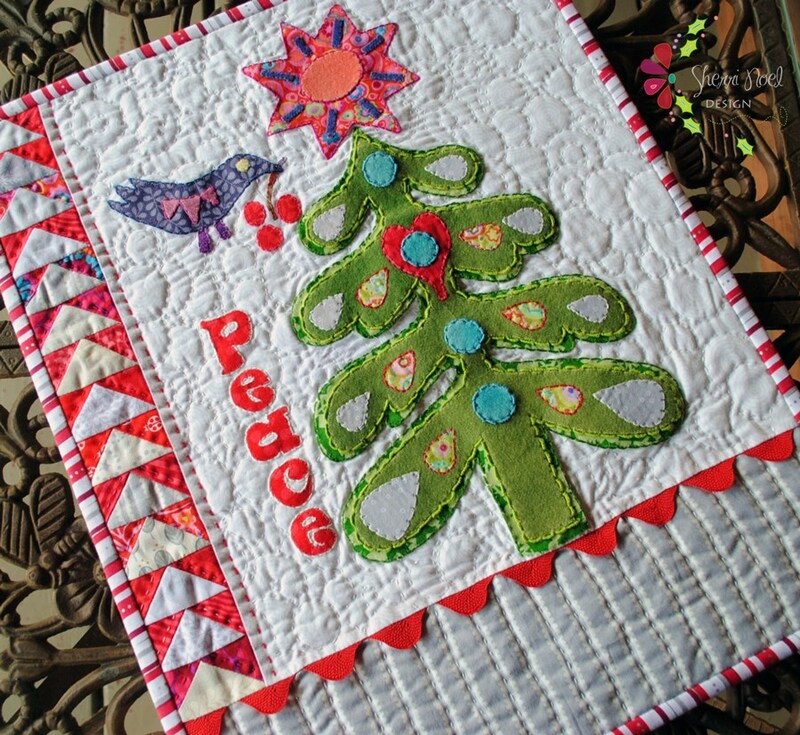 Christmas Tree, designed by Australian quilt artist Wendy Williams, was the subject of a quilt-along by Elizabeth Eastmond at OPQuilt. Elizabeth writes, "I hand-stitched all the flowers and birds while on a trip to Lisbon [Portugal] and Spain in order to complete the quilt in under a year. This pattern... was an inspiration of fun, whimsy, and technique. I did finish the quilt just shy of Christmas Day." Quilt designer Wendy Williams is known for her wool applique and contemporary, simple shapes depicting elements of nature, such as birds, flowers, and trees. They are rendered here in clear, bright wool felt embellished by Elizabeth with embroidery thread that is often in analogous or complementary colors. The beautiful birds and leaves give a sunny, almost tropical mood to this tree of life motif. At the base of the tree is a lovely Nativity scene featuring Mary, Joseph, and baby Jesus, with the Star of Bethlehem shining brightly overhead. These pure, color saturated fabrics shown against the white background, along with Elizabeth's beautiful stitchery, provide a joyous sense of energy and liveliness. Image credits: Photos were taken by Quilt Inspiration at the 2018 Road to California quilt show. Welcome to Twelve Days of Christmas: Day 4 ! 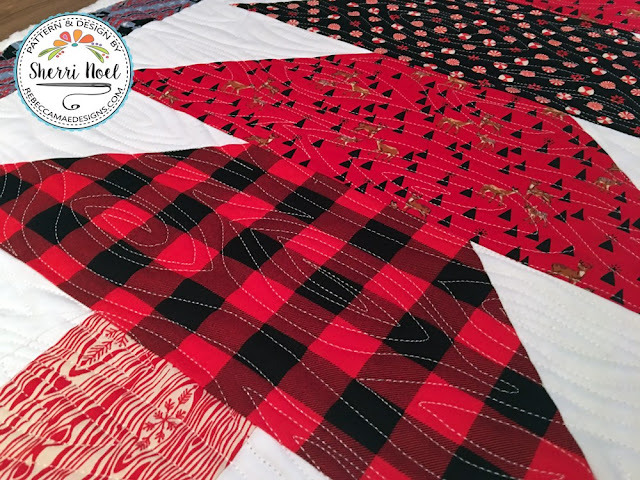 Ellen writes, "Over 2 years in the making, this McKenna Ryan quilt [pattern] was enriched with Sharon Elsberry's quilting! I was so happy to hang it for Christmas." Ellen's work shows the animal kingdom happily playing on a snowy winter's day. In this scene of 6 panels, you'll find black bears, cardinals, a bluebird, a family of deer with their little fawns, a fox, a racoon, a moose peeking in from the side; and of course, Santa with a sleigh full of toys and 8 tiny reindeer. Ellen's fabulous applique work is complemented by the lovely batik fabrics in various shades of spruce green, cranberry, teal, aqua, icy blue, plus orange and red for Santa's sleigh. We congratulate Ellen on the completion of what is sure to be a treasured heirloom to be enjoyed each Christmas season and into the New Year for all the years to come ! Welcome to Twelve Days of Christmas: Day 3 ! Suzanne Hillestad says, "An autumn pattern was the inspiration for this quilt. I changed the colors to black and red, paper pieced the poinsettias and added the vines, leaves, and holly berries. This will be donated to the Festival of Trees Quilt Auction." 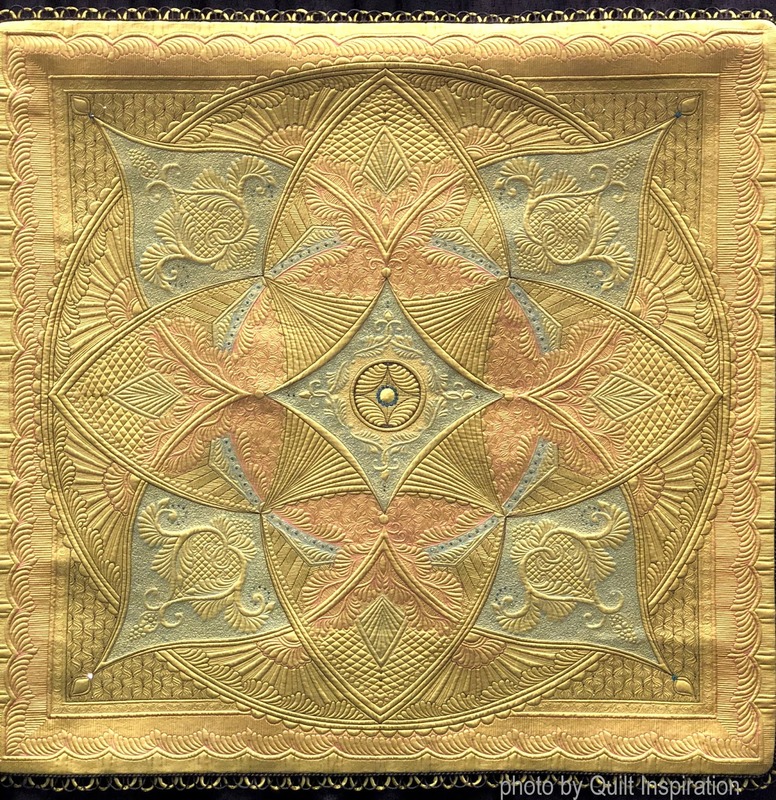 The beautiful quilting was done by Melissa Kelly, who used wool batting to give it the trapunto look. As shown below, veins were quilted onto the holly leaves, while the black border was quilted in an overall swirls design. The quilted loops within the large black triangles are the perfect touch. Image credits: Photos were taken by Quilt Inspiration at the 2018 Springville, Utah quilt show. Welcome to Twelve Days of Christmas: Day 2 ! It came upon us so quickly... but believe it or not, it's that time of year again: time for Twelve Days of Christmas Quilts ! We will be featuring an inspiring quilt each weekday, starting today and ending on Christmas Eve. We wish you a very happy, healthy and creative holiday season. Enid explains, "This piece was inspired by travel posters of the 1950's and 60's, with their bold colors, simple shapes, and stylized landscapes. The blue of the shadows in the snow creates depth. Tiny houses, cars, and skiers add more to the story. " Enid used machine piecing, machine applique, painting, and machine-fused embellishments. Her materials for this charming original design include cotton fabrics, cotton batting, cotton/poly thread, and gold lamé. Enid's use of bright, happy solid colors creates an enchanting sense of coziness and hominess amidst the snowy mountains. What a perfect place to spend Christmas vacation -- even if you don't ski and are perfectly happy (as we are) to sit by the fireplace and quilt ! p.s. Check out our many NEW LISTINGS at QuiltInspire on eBay ! And for continuous free quilt patterns, please follow us on Twitter! This delightful quilt by LeeAnne Timpano features the opening to Clement C. Moore's Christmas poem, "Twas the night before Christmas", done in the shape of a whimsical Christmas tree. Likely these words conjure images of Santa Claus as they bring a smile to your face. The quilting was done by Barbara Futoma in an overall snowflake design that fits the holiday theme. This fun quilt was entered in the Medium/Large Applique category at the 2018 Quilt Arizona show. The fusible applique design, by Emily Cier at Carolina Patchworks, is also available as a printed fabric panel at Spoonflower. Happy Thanksgiving from Quilt Inspiration! We're very grateful for all our wonderful followers who have joined us during these past eight years ! We'll be spending a few weeks entertaining family and friends, then we will return to this blog and to eBay. Please stay tuned, and we'll see you soon. We hope you will enjoy this photo of Margaret Solomon Gunn's award-winning quilt from the recent Pacific International Quilt Festival. 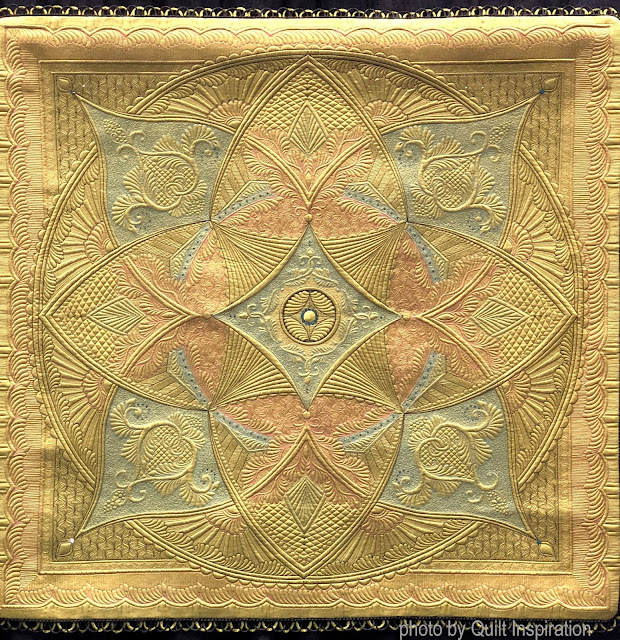 Persistence, by Margaret Solomon Gunn, was chosen as Best Wall Quilt at the Pacific International Quilt Festival 2018. She writes, "This original design was an act of persistence from the quilting with contrasting threads to the funky binding. Sometimes the quilter needs to play!" We think that "Persistence" is spectacular, with a stunning radiant glow. Margaret explains that she started with a piece of silk from her collection, intending to do a wholecloth design on the longarm machine. She named her quilt "Persistence" partly because one of her challenges involved changing the center medallion, which you can see above. Margaret mentions that she quilted it and unpicked it several times. Finally, she appliqued a small circle to the very center, then embellished it with crystals around the outside of the circle. If you look at the very center, you can see the crystals. Margaret further enhanced her work by using black thread to emphasize the individual sections of the quilt. We congratulate Margaret on her breathtakingly successful work. For more information on her work, see Margaret Solomon Gunn's blog at Quilts of Love. Image credits: Photos were taken by Bonita McFadden at the 2018 Pacific International Quilt Festival. We really enjoyed the ofrendas at this year's Day of the Dead celebration in Phoenix, Arizona. Day of the Dead is not meant to be a sad or frightening holiday, but an uplifting time to remember loved ones who have died. An ofrenda ("offering") is a collection of objects placed on a ritual display. We've often talked about Day of the Dead quilts, but these ofrendas are mixed media works of art. We're including the descriptions so you can read about each of these fantastic creations. Note: For quilt patterns, vintage jewelry, and other treasures, visit us on E-Bay - We're Top Rated Sellers! And for continuous listings of free quilt patterns, please check us out on Twitter ! The larger-than-lifesize carved figure is embellished with everyday items: hair combs, cloths pins, and bits of metal, as shown below. The heart is depicted with flames around it and with sticks, akin to daggers, through the heart, as is common in Mexican folk art. Male and female aspects of Ometecuhtli are depicted in the beautifully painted portraits by Patrick Murillo. In keeping with tradition, marigolds, candles, sugar skulls, and corn were used on this ofrenda, which was also decorated with papel picado. The lighted figures, representing opposing forces in the Aztec universe, are wearing elaborate feather headdresses. They are lighted with a rotating light source that gives them an ethereal, otherworldly appearance. Patricia Silva says, "I feel we live in a time where we have chosen to forget about a higher power in which we all were created from. Whatever your beliefs may be, there is one thing we all share. We could not exist today without the sun and the moon, male and female, motion and stillness, order and chaos. My hope is that we learn soon the importance of the balance of all these opposing factors." This striking painting depicts the sun and moon as stylized figures, using Aztec imagery in a modern way. Edgar Fernandez says, "Within this Ofrenda, I have embraced the ancestral importance of how the sun and moon are in union and one cannot exist without the other.... My ancestors captured the beauty of all life in a spiritual way and they understood and celebrated the sacred duality in community and ceremony." The images in this altar appear in many of Martin Moreno's works; the balance and harmony of man and woman, yin and yang, life and death. The purple sign urged visitors to "Honor Your Ancestors"; Take a rose petal, write the name of a loved one who has passed on and place it on the altar." Many visitors participated, as you can see from the piles of petals. Image credits: Photos were taken by Quilt Inspiration at the Desert Botanical Gardens in Phoenix, Arizona.